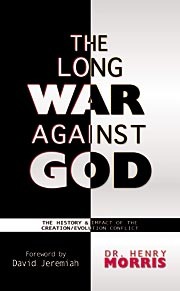 The Long War Against God is a landmark book, tracing the origins of evolutionary thought from the dawn of history to the present time. Learn how Greek philosophy, Darwinian evolution, and humanism all have polluted man's knowledge of the true God. Morris has spent 55 years researching evolution's origins, and this heavily documented work is a fascinating read for anyone interested in the behind-the-scenes developments that ushered in the modern philosophy that seeks to eliminate God. "The fact is...that [Darwin] really only served as the catalyst for a revival of ancient paganism, coming at just the right time in history to bring to fruition a revolt against God for which many in Western Europe had been preparing for over a century". With this truth we would most heartily agree. Dr. Morris rightly believes that his book will be controversial. It will, but only amongst the uptight mediocrites who can only think along tramlines. This is always a very absorbing and interesting book by an original thinker which examines the modern children of evolution theory (political, social and cultural), the ancient "spiritual" background to it, coupled with an examination of the dark, conspiratorial forces which nurtured its widespread acceptance in the nineteenth century. "The Creator has imposed the law of decay and death on his whole creation because of the rebellion of its human stewards. Therefore only he can defeat death, and this only by paying the redemption price himself, dying for sin and then rising victoriously from the dead. Thus the great miracle of resurrection requires the prior great miracle of supernatural creation". This book is peppered with such insights and should be read by all those who are brave enough to expose themselves to new ideas and who wish to acquaint themselves with a deeper knowledge of the ramifications of evolution theory and its interaction with the Church of Old and New dispensations. This page was last modified on 6 August 2012, at 09:16.